The laundry, dishes, errands, extracurriculars, doctor’s appointments, homework, lunches, backpacks, school activities… it all comes at me like a freight train on a treadmilling loop. It has all become so overwhelming that I’ve instituted something I call “rest checking.” Each week, I scroll through my calendar until I find an “opening” for rest. Until I find it, I feel my throat closing up a little with each passing busy, congested, over-productive day. Once I’ve found it, I find release… physically, mentally, spiritually. But isn’t it sad that we have to search for rest? Shouldn’t it be a given? Apparently, not in Western culture. We’re expected to bake cookies for our kiddos’ benefit while conference-calling and cooking dinner for our family… and squeezing in a folded piece of laundry while dinner’s in the oven. I contend that we were made for rest – literally. Aren’t we made in God’s image? And didn’t God, the creator of the universe and Lord over all – even smartphones on which we pack our e-calendars – rest on the seventh day (Genesis 2:2)? Does the Bible say to stay busy until you run yourself ragged? Is this how we should honor Him? Last time I checked, no! Although He warns against idleness, His example clearly supports a balance of work and rest (Proverbs 31:27; Genesis 2:2). We all need time to physically rest, to spiritually rest, to fill our tanks. If we don’t rest physically, our immune systems are depleted and our neural circuitry is overwhelmed. We get sick and anxiety and depression strike. My kids will tell you that I become an over-stimulated ADD mommy-monster! If we don’t rest spiritually, we become raisin-souled – displaying anti-fruit-of-the spirit qualities like crankiness, harsh judgment, and narcissism. 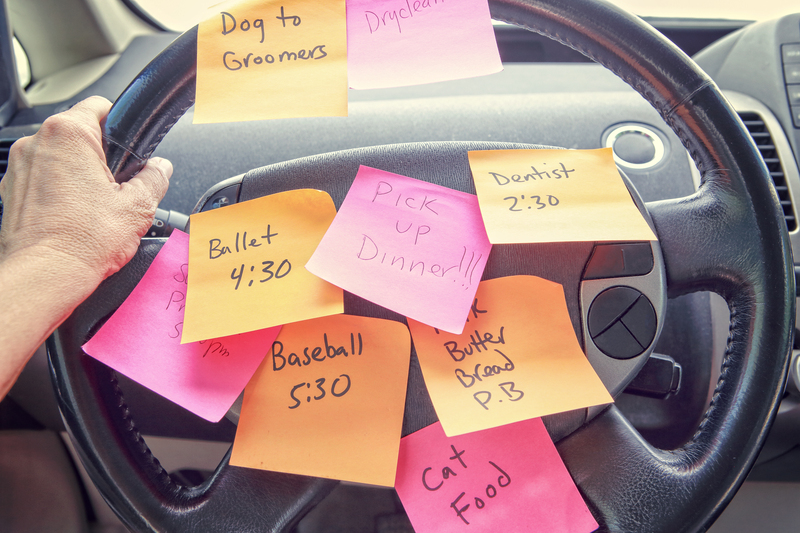 Why are we determined to idolize busyness when it can wreak such havoc? First, let’s examine why we became so busy. The American Dream is a fantastic thing, but I’m afraid we’ve chosen the Extreme Games version. What started out as an earnest and worthy ode to working hard and making something of our lives has morphed into a perceived obligation to “work hard” at everything we do… even rest. Heaven forbid we not schedule a “leisure activity” during that 45 minutes between gymnastics and choir practice. Further, our culture commonly advises us to schedule everything, including rest! I’m guilty! But scheduling itself can be exhausting! When I try to make a doctors appointment these days, aligning my schedule with the office’s is as simple as a root canal. Each week, I’ve had to add a list called “calendar additions” to my To Do list. Scheduling seems to dive-bomb me incessantly… Sometimes I just want to duck and cover and let the “scheduling bombs” fall where they may. What I should be thinking is “I should follow God’s example to rest.” I should put down my smartphone in the name of the Lord. I should ask Him to wash over me. I should pray. Because how can we forge a meaningful relationship with God without resting in prayer? How can we fulfill His deepest desire to have relationship with us without resting in prayer? And this brings me to how Christianity is being eroded by our busyness. How many times have you found yourself too tired to drag yourself out of bed to attend church or bible study? How many times do you have an extracurricular commitment for your precious kiddo that conflicts with your church or bible study? What do you choose? I bring this up not to be accusatory, but rather to illuminate my own struggles. I’m so fried from over-scheduling that by the time I get to God time, this girl is nap-bound. I reason that society will judge me less for missing church or bible study than missing my child’s gymnastics meet. And so I’m back to worshipping the idol of busyness over God. The irony of it all is found in God’s offer to give us rest! He so clearly wants to give it to us, and even longs to fold our tired souls into his warm embrace. Just take a peek at Matthew 11:28: “Come to Me, all who are weary and heavy-laden, and I will give you rest.” We just have to listen and go to Him. He is there waiting. So, I’m now on a mission to promote rest. For God, myself, for moms, for dads, for friends, for we weary American Dreamers who built this country on trusting in God, but who have lost Him to busyness. How do we start? Maybe the next time someone asks what you’re up to, say you’re enjoying resting. Resist the urge to say “I’m so super busy and feel like I need a vacation.” Consider saying “yes” to God and “no” to busyness. I promise He’ll notice… And maybe even bless you with that nap you’ve been looking for! 1. How have busyness and rest influenced your relationship with God? 2. How can you invite more rest into your life?